Members of the Flagler County Democratic Club will gather at noon Tuesday in front of the Flagler County Health Department on Dr. Carter Boulevard in Bunnell to celebrate the first day of the enactment of the Affordable Care Act—and to protest Florida’s many obstructions against the health law known as Obamacare. The health department at 301 Dr. Carter Boulevard is not a visible place: it’s at the end of a little-trafficked side street, and the noon demonstration is scheduled for only an hour. But Democrats chose the health department because state Department of Health ordered all its county affiliates to prohibit use of the facility by federally supported “navigators” helping Floridians enroll in health insurance plans under the new law. Florida refused to set up health insurance exchanges in line with the law, leaving it to the federal government to do so. There are just 56 parking spots at the facility, and about 150 customers use the department each day. Johnson was concerned about those customers’ privacy. “If it has no issues about our patients and doesn’t affect them coming in and leaving it’s a non-issue for us,” Johnson said, though he was not enthusiastic about it. He’s also defended the state’s order to deny navigator access to his facility. Shapiro said he would be emailing Johnson and the sheriff’s office to let everyone know “that we intend to stay to the sidewalks, not block entrances or exits to the building and allow anyone to pass who wants to and not to disturb the peace in any way.” He said the protesters don’t even intend to address customers at the department. Dave Sullivan, who heads the Flagler County Republican Executive Committee, said there are no plans from his side to protest—let alone support—the new law. “There are many, many questions about Obamacare as to whether it will really help or hurt in the long run,” Sullivan said, “and the view of Republicans is: we should have come up with a better bill that would in the long run helped everyone if we had been willing to do a little back and forth when it was passed originally.” But, Sullivan said, he was supportive of the actions Florida has taken against the law to date. Republicans have opposed the new law but have not come up with alternatives different from the status quo that existed before it passed in 2010. They have nevertheless kept up a drumbeat of criticism, made Obamacare the centerpiece of their attempt to defeat Barack Obama in the 2012 election, and have continued to attempt to derail his presidency since. Congressional Republicans voted to defund Obamacare and alternatively, have refused to approve a new budget with Obamacare included. That has led to a stand-off with the Senate—and the very strong likelihood of a government shut-down starting at a minute after midnight on Tuesday, the same day of the planned protest in front of the health department. Various aspects of the health law have already kicked in, such as expanded coverage for preventive care, the end of lifetime caps on insurance coverage, and an allowance for adult children, up to age 26, to remain on their parents’ insurance. But beginning Tuesday, most of the 45 million Americans without health insurance will be required to buy insurance, and those who can’t afford it will be eligible for federal subsidies to enable them to have insurance. Also, insurance companies will no longer be allowed to end an insurance policy if someone becomes sick, and insurers will be prohibited from turning anyone down for having a pre-existing condition, as insurers routinely did until now. Political and logistical opposition aside, the health law has been subjected to a ceaseless barrage of misinformation and false claims, such as the notorious, and notoriously false, invention of “death panels” that Sarah Palin popularized, or that it is a government take-over of health care. The health law’s central premise is built on the private insurance market, which stands to make the greatest lucrative gains from Obamacare’s enactment. The Tampa Bay Times’ Politifacts last week released the 16 greatest myths about the new health law. I would like to hear from someone who has read it all, knows what’s in it and can explain it. Until then, protesting for or against something you know nothing about is irresponsible. I have lost hope in both parties (both Democrats and Republicans). Each party has their own agenda and refuses to listen to the people. The fact is: we have a healthcare problem in this country and I don’t believe private healthcare is the answer. While we get more innovation when healthcare is a for-profit business, we also lose healthcare because people with pre-existing conditions are unable to get care. What this country needs is REASONABLE politicians who can get things done. The core of every healthy relationship is compromise. We compromise every day with our loved ones, our friends, our family, etc. I don’t understand why our selfish, lazy and out of control politicians cannot get together and COMPROMISE. Both parties seem to not want to meet with eachother and discuss how to fix the problems we face as a country. It’s disappointing and very deflating. Please support the Affordable Care Act (Obamacare)!!! EVERY PERSON in our country should be entitled to good health care. . . not just for the privileged few! Please do not be fooled by the same kind of ridiculous obstruction and fear mongering that happened during the passage of Social Security, Medicare and Equal Rights laws. Let each of us move forward towards being the great nation of the UNITED States of America again! Social Security is headed toward bancruptcy and medicare is broke. President Lyndon Johnson Ok’d the use of Social Security funds being put into the general fund. Since then every president has spent the money and issued IOU’s. Yet you espouse that we should not believe the “fear mongering” about the Affordable Care Act. Currently the fear mongering is coming from the White House. Paying the interest on America’s debt has nothing to do with the current budget stalemate. So whose doing the fear mongering now. By the way, I just recieved notice that my health care premiums will increase by $110.00 a month. Is this a result of affordable care. @Dennis says–I think the obstructionist Republicans in Congress, and their supporters, have a lot of nerve complaining about how Obama is trying to bankrupt the country by having the guts to activate a program of healthcare that will cover all Americans, instead of only the select and lucky ones who have it now. You want to complain about reckless fiscal policy? How about the Republicans in Congress, especially those oh-so-patriotic Tea Partiers, who will be responsible for a government shutdown that will effect thousands, if not millions, of people for God knows how long if they don’t get their way? They are willing to let countless citizens of this country suffer so they can stoke the fires, stroke their egos and stage a world-class hissy fit. They would hold this entire country hostage to an ideology built on fear, lies and rigid self-indulgence. It doesn;t matter to them if the stock market tumbles because of this stunt they are pulling. The whims and interests of one entitled class of citizens should not be allowed to run roughshod over the public good. This is what you are supporting. Wrap it up in the American flag all you want. It’s selfishness, pure and simple. And, if the Republicans get their way and the government shuts down at their hands, they will deserve yet another thrashing come election time. While they point their collective trigger finger at Obama, Reid and Pelosi, they should take notice of the three fingers pointing back at them. The Republican Party has become its own worst enemy. ASF I’m not a Republican. And yet, how are the two any different, if you look past the partisan rhetoric? Fact is – they aren’t. This law is probably going to save both my life and my 10 year old daughter’s. We both have serious medical conditions (auto-immune). I have been uninsured for the last 19 months due to being self-employed. On January 1st I will finally be able to get covered and get the full treatment I need again. My daughter fortunately was on a really good private policy before she got sick – thanks to the ACA she was able to keep it after she got sick since the practice of recission was pretty much banned in the law. 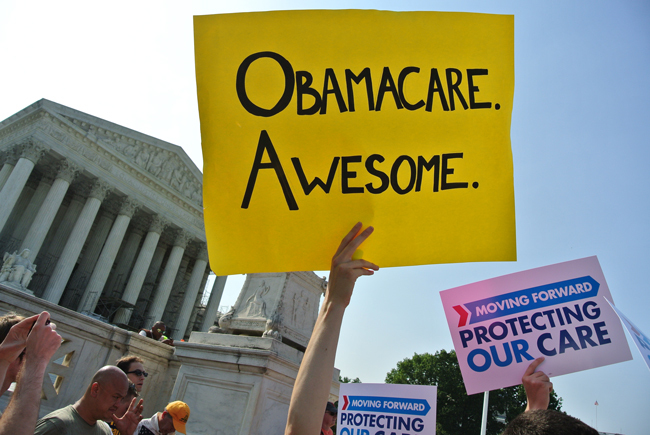 Americans disapprove of unworkable obamacare for solid reasons. These progressives are incapable of thinking for themselves and are nothing by far left drones taking their marching orders. Unfortunate and pitiful people. @John Adams says–And the Republicans are only interested in blowing up any and all efforts at Affordable Healthcare. They have spent all their time, energy and resources in trying to get it repealed and have contributed nothing solid in the way of ideas, actions and words that address improving it. They are so focused in defeating anything that might add to Obama’s legacy that they are willing to shoot themselves repeatedly in the foot to do so…and they are willing to take the entire country hostage in those futile attempts. If you have solid reasons for disapproving of the ACA (and I don’t doubt that you do), let’s hear your (and the Conservative politicians) solutions. The Tea Party, in particular, is totally against change and open-minded thinking at any cost…Ironic, considering how they like to paint themselves as American patriots and our entire history, at its finest points, is a celebration of courageous and progressive action and an open exchange of ideas. Enjoy your obamacare which has already DOUBLED in cost since obamma lied to America about it. You will enjoy not being able to stay with your current doctor or insurance company, higher taxes, huge insurance rate increases, less choices, higher medical costs, far fewer doctors, much greater waiting times, lower level of care, greatly increased unemployment and layoffs, masses reduced to part time worker status from full time status, young people paying disproportionately high premiums, giving all your personal information to the government who is notorious for disorganization and leakage, employment of corrupt “navigators” who will be directing you to the lowest forms of coverage. Of course, the progressive liberals won’t tell you about this. They just repeat the obamma mantra in drone like reptition. America, you had better open you eyes but fast to the monstrosity and triain wreck that obamacare actually is. These must be the same deadbeats that were at the capital.. Some more wasted money.. Doesn’t any of them have jobs?? The Congressional Republicans and their dogmatic followers mantra. I’ve got my health care. Now I am going to do what’s best for the American people and will try to block you from getting yours. And those solid reasons are????? Unworkable??? Disapprove if you must…. I sure do… I want a single payer system… time to get rid of health care for profit. And the “solid reasons” Obamacare is “unworkable” are? Should those with illnesses such as diabetes or cancer or high blood pressure not be entitled to health care. . . as it was under our old system? Or, should we continue to be the only first world country without any sort of public access health care? Please explain the “legitimate” reasons why we should not embrace the Affordable Care Act. . . other than the fact that FOX (not) News, and Rush says so. You know its bad when even the spoon feed democrat controlled unions are against it. You know it’s really bad when all of the congressional staffers need to be subsisted for it. Every Democrat that voted for this law should be forced to participate in this train wreak. The young people unemployed, with part time employment or working with no benefits and the poor need the right to health care too. The millions of young and older Americans need Obamacare and I am all for it. I would not benefit or be undermined by Obamacare, but I want it for my fellow Americans old young and specially our American children!! What is wrong with you all people that oppose it? Don’t you have compassion for your own? @confidential says–The answer to that would be “no.” And how many of these fine compassionate people do you think probably attend church on Sundays and feel oh-so-holy when they slip a dollar bill in the collection plate? Some people are incapable of seeing the larger picture (even if they wanted to, which they don’t), if doing so means they might have to look beyond their own noses…How distasteful and inconvenient! Read the bill, it is very flawed, over 2000 pages worth; I agree everyone deserves to be able to purchase health care insurance. I do not believe it should impact business; the bill as it stands will force some small to medium businesses to reduce hours to less than 30 to avoid the plan. I say repeal it and go back and build a plan that will actually work, most poverty level and even middle class will probably not be able to afford what they offer anyway. The people who are barely making ends meet will forgo the insurance, then get hit with a fine or the IRS will keep their tax return money to pay for the lapse in their insurance. The last government division you would want in charge of this is the IRS, they cannot even handle their tax issues, and they were under scrutiny for lavish spending just this year. Our top officials need to swallow their pride and work together to build a plan that will work, this cannot be ego driven or we all fail. Politicians need to remember why we voted them in, to fix the problems of this once great nation, not get rich off of lobbyists and have more vacation time than most Americans see in 5 years in just one. The pathetic reality of our current deficient and intended only to serve the Have’s but disserve the Have Not Health Care can be seeing in the example endured by a friend this weekend In Sanford Florida. She hurt a finger while cooking dinner and enough to need treatment . She has her health care insurance 50-50 coverage by her employer. She went to the hospital and they told her the bill would be as high as $2,200 (about her annual deductible total for ER). Then she turned around and went to the local Urgent Care were they treated her nicer, they tended her injury and provided her medications all for only $110. Tell me why Obamacare is welcomed because ends with the fraudulent abuse of our current Health Care System…and the white elephants feeding on it, called insurance companies, hospitals, pharma and equipment manufacturers. Yes we do have a mafia style battling against Obamacare thru Congressional and Senatorial grafts. Strip Congress of the luxurious Health Care they enjoy provided by force by us all, that they denied to us!. They haven’t let the administration work in the job recovery plan for the country so slash those politicians pay in half. They need to feel the pain. They do not grasp it yet, that they lost two elections in a row and still want to run the administration. YOU LOST in 2008 and 2012 get it yet? We better come out to vote in droves in 2014 and 2016 to get out of this Conservative extremist dug hole. I am NOT supporting obamma’s train wreck “health care” and will avail myself of paying the fine. I am not supporting those who chose not to work, chose to be parasites on society due to the lessons from obamma. If obamma wants to help so much, why doesn’t he donate more money to charity and spend less taxpayer billions on himself.